Great review. I have one of these, and I’ve discussed most of the same issues with it. I’d love to see a skyline 2 with the jimping, better clip, and improved thumbstuds. As it stands its a good knife and an excellent deal. I firmly believe an improved version would stand next to the griptilians in greatness. Thanks Roadkill! Glad we see eye to eye here. The Skyline is an excellent little blade and I still carry mine all the time. Some upgrades on this classic design would make it perfect. skyline simple design great materials good flipper. Matt I think you summed this one up pretty well! The Skyline is a USA made classic. It’s not the fanciest knife but it will get the job done for not a lot of money. I’ve read many reviews about the Skyline and based on the positive reviews I finally bought one. Although it is always said that this knife isn’t comparable to knives much more expensive, I would have expected more. The thumb studs are a joke. I’m not able to open the knife using the studs even with two hands. When trying to do so, I’m horrified how coarse the edges are. I’ve seen someone saying that the thumb openers are simply blade stoppers and that’s true. But they are the worst way a blade stopper could be implemented. Since it has been designed to be a flipper, the flipping action should be looked upon. “Action” is the wrong word, though… You can flip it by 90° at best. The rest needs to be done with a strong movement of your hand. There is no way to open the knife unobtrusively. Since I would like to use the knife as an EDC, I would like to be able to use it in any situation where a knife comes handy. But I feel uneasy when pulling out a knife and openening it in a theatrically way. That there is no way to open the knife in a simple way is a major drawback. I own a Real Steel from China which I bought for nearly the same price and its quality is much better. There are a lot of positive things to say, also. I love the design. The blade is sharp as hell. It’s very lightweight. The ergonomic of the grip is great. But I wish someone would invest some more money and make it a flipper worth being called a flipper, leaving away the useless thumb opener dummies. Still the Skyline is a good knife, but based on the one I own since today, I would say the Skyline is great design idea done cheap and without love. Thanks for the detailed comment. I honestly think you got a bad knife. I have owned a couple of these knives, and while the flipping action isn’t amazing, the knife still opens with the push of a finger. The poor fit and finish on your handle leads me to suggest that this one may have slipped past their QC somehow. The Skyline is a pretty old design at this point. There have been big strides in terms of flipping action, but this knife still remains intriguing and useful to me. I don’t think I will ever sell mine. It’s thin, light, and it works. We are all entitled to our own opinions, and I certainly appreciate yours. 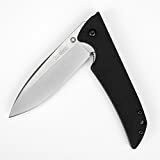 I agree, it’s not a perfect knife, especially by today’s standards, but I would recommend sending yours back to Kershaw to see if they will send out a new knife. From time to time I feel the need to buy a new knife. I fell in love with the Skyline but was disappointed and so I had to continue my search. I’ve searched for other pretty knives with a spear point blade but found nothing. While reading about the Skyline I often found Kershaws Speed Save technology mentioned and since I haven’t owned a Kershaw before, I decided to give it a try. I’ve picked the Cryo II. That’s really a good knife, as far as I can tell. The only thing which irritated me at first was how heavy it is. The second thing I noted was that I will cut my thumb in pieces if I use the thumb stud! When I use it, the spring assisted opening will do its work and opens the knife by 90°. But my thumb wasn’t fast enough to keep contact to the thumb stud. So when I move my thumb to opn the knife, the blade opens faster than my thumb is, the comes to a rest and then my thumb arrives at the sharp edge of the blade. Somewhat hard to describe. Then I’ve taped the blade to see if I can get used to some sort of thumb action which will open the bladde completely without cutting into my thumb, but I wasn’t successful with that. But that’s no pitty: the flipping action is really great and it makes a lot of fun opening the knife. Closing it with one hand is less funny, but you can get used to it. But what should I say? I really fell in love with the Skyline design and so I kept looking and finally found something which made me think that someone really has taken the Skyline design and improved it: I found the Kershaw Bevy! It’s hard to find information in the net about that knife, which is kind of strange. It’s really cheap, even in Germany and so I didn’t hesitate to order one. It was delivered yesterday and today I had time to look at it. It also feels quite heavy, but the design closely resembles to the skyline. The blade looks exactly the same (though bigger) and the handle design is also obiously very close to the Skyline. In contrast to the Skyline it comes with speed safe technology so flipping it open is a breeze. When closing the Skyline there is not much room to get a grip fo the lock but looking at the Bevy you will find that there is much more room for your thumb which also makes using the thumb stud possible. But I don’t think I will ever use it: I still fear cutting myself when the blade rushes out. And now I have a Bevy and a Skyline and both are looking great! Comparing them one by one is fun: the slim and lightweight Skyline and its bigger and bolder version, the Bevy. The Bevy comes with a deep carry clip and speed safe, but the size and the weight makes me think of it more like a tool than as a knife, while looking at the slim, lightweight and elegant Skyline leaves n doubt that it makes a great EDC. Is this still USA made? There are some reports now that people are receiving made in China version where it says “USA MADE” on the package up top but says “made in China” towards the bottom. Can you please clarify this? Thanks. After reading this review a while ago, I bought one from Amazon US and started using it – I am very happy. This one says “Made in USA” on the blade and the excellent quality does not suggest this has come out of China. The Skyline is a very nice quality knife for a very reasonable price, it is surprisingly thin and light, ideal for EDC. For heavier knives, I prefer a belt pouch, but the Skyline easily goes into a pocket without bulging. The blade comes very sharp and I love the surface texture and shape of the blade. I will have to get used to the opening mechanism, I’m used to opening knives using a thumb stud. The hinge of my copy is too stiff to flip it open. But that’s just a question of getting used to a system that’s new for me. This knife would not stand up to much abuse, but the tougher jobs should be left for fixed knives anyway. Hey Peter, Thanks for checking out the review. The Skyline is a classic light duty EDC knife. Great blade for opening mail and boxes, cutting fruit, etc. Glad you like yours!